OK, a new year means resolutions, new ideas and hopefully new energy. So let’s start with a new marketing plan. You do not need a full plan with all the detail of what you are doing, however, the more detail you have the better. The most important thing you need is a structure. We have made a change here, in that we are not going to run our weekly rota of taking each major issue a day at a time. The reason for this is that we want to go into more detail of each subject and this would be far easier to stretch out the content over a whole week. Make sure that your structure has some wriggle room. Don’t make it too constrained so that you cannot keep up, or lose focus on other work trying to keep control. Next, you need ideas or areas of focus. I hope that you have lots of ideas about what you want to do. if not, then you need to spend a little time brainstorming. List out your plans with time, importance and difficulty. You obviously want to tackle the important issues first, but don’t put all the difficult issues at the start. You will find this hard work and so will your customers and followers. So, remember to mix it up with some easy win content. You may have major dates link trade shows, conferences etc. This can be part of your annual plan. The more detailed actions can just be mapped out for 3 – 6 months. Your plans for 2018 need all the mundane things too, like annual accounts, VAT to tax quarters, employee holidays. Any event or time when you are going to be short staffed or short of time to keep up your plans. 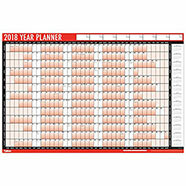 Try putting your plans on a large 2018 wall calendar. Dry wipe could be a good idea for being able to make changes. Something big on the wall is much more effective than some spreadsheet on a computer. Many companies use a rolling 180-day planner, so they can wipe off one month and continue forever. Plan 50% or less of your time for overruns and unforeseen issues. You may improve your delivery in the future, but wait till it happens. Don’t forget to gather feedback from customers and staff. All plans are subject to change.